(OPride)—Eritrea’s Isaias Afewerki landed at Addis Ababa’s Bole International Airport in the Ethiopian capital for a three day visit. The President accepted Ethiopian Prime Minister Abiy Ahmed’s invitation to visit Ethiopia as part of the continued initiative to restore diplomatic ties between Ethiopia and Eritrea. 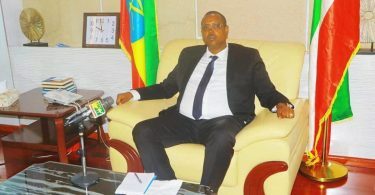 It is the Eritrean government’s second official trip to Ethiopia in as many weeks, following up on a trip made in late June by an Eritrean delegation led by that country’s Foreign Minister, Osman Saleh. Coming a week after Prime Minister Abiy Ahmed’s groundbreaking trip to Asmara last week, the Eritrean President reciprocated, making it his first trip to Ethiopia in 22 years. The rapprochement between the two nations puts a close to over two decades of political enmity between the two states. The two nations had fought a devastating war between 1998-2000 that left around 70,000 people dead. In the eighteen years since hostilities ended, both states remained in a perpetual state of war with hundreds of thousands of soldiers manned on their common border. But after a recent decision by the Ethiopian government to vacate its troops from the war’s flashpoint, the town of Badme, Asmara warmed up to an offer to rekindle ties. Between today’s visit and Prime Minister Abiy’s stay in Asmara last week, institutional efforts to bind the two countries have seen Ethiopian Airlines announce plans for direct flights between Asmara and Addis Ababa starting next week. Direct phone calls between the two countries, had been blocked since the war. This week, with the phone connection between the two countries restablished, Ethiopians and Eritreans were reported as making phone calls to random numbers in each other’s countries just to say hi to strangers they hadn’t been able to call in decades. On social media, nationals of both countries expressed their delight with the thaw in relations. 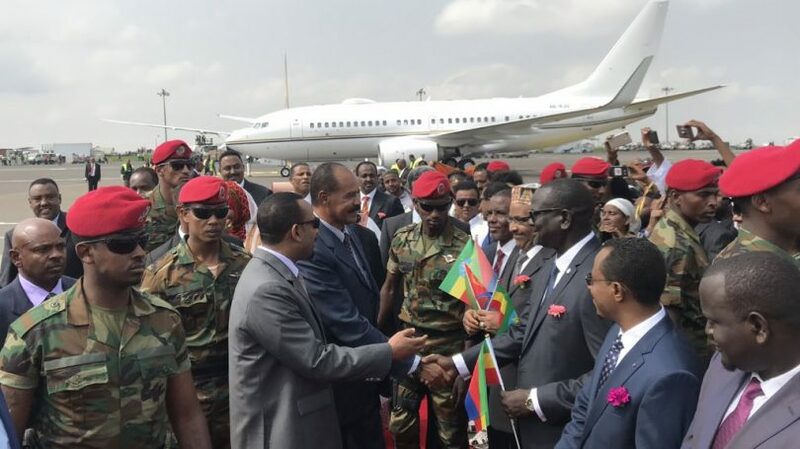 A marching band, a dance troupe and a heavily armed contingent of commandos flanked the Eritrean President as he stepped off the plane and onto the tarmac. There was a repeat of last week’s warm embrace with his new ally, Abiy Ahmed. The two exchanged pleasantries while dozens of onlooking reporters, kept at a distance by the security detail, clamoured for photos. The duo were whisked into a vehicle of an awaiting convoy. 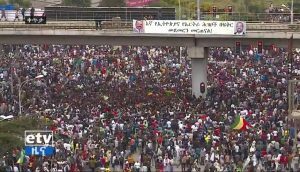 Thousands of people poured into the streets of Addis Ababa along the path the convoy would go through en route to the Prime Minister’s residence. Ethiopian and Eritrean flags fluttered in the air all over the city. At one point along the convoy’s path, a woman carrying a large poster bearing the image of the two leaders. Crowds of youths chanted and sang songs with lyrics championing peace between the two states. It is clear that not everyone in Ethiopia takes too kindly President Isaias Afewerki’s arrival on Ethiopian soil. 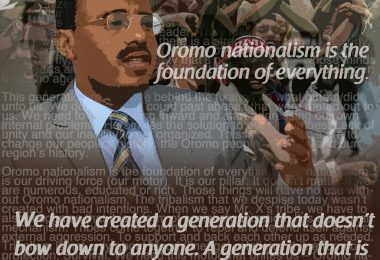 As the convoy drove around Addis Ababa’s Hilton Hotel, crowds of youths started jeering the Eritrean President. Chants of “Go home Isaias!” could be heard as the tone of the crowds on the street started to turn decisively nationalist. Despite chants and vocal expressions of love towards Eritreans, it’s clear that among Ethiopians, there’s no love lost for the man himself. State broadcaster Ethiopian Television (ETV) decided to cut the audio and play music during their live broadcast as crowds of chanting youths waving the flags of both countries, continued to deride the Eritrean President. 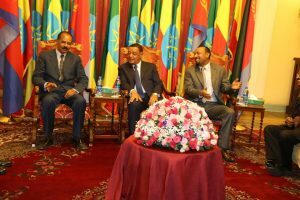 The Eritrean President would next meet with a host of Ethiopian diplomats, among them Ethiopian President Mulatu Teshome, Oromia regional President Lemma Megersa. 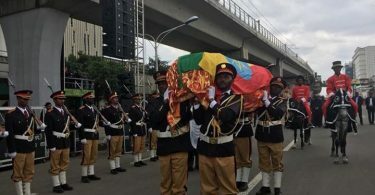 During his stay in Ethiopia, President Isaias is expected to oversee the opening of an Eritrean embassy in Addis Ababa for the first time since 1998. A visit to the city of Awassa is also believed to be scheduled. Zecharias Zelalem is a writer and journalist tackling sports and politics. 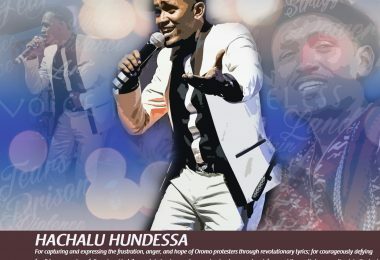 He's also a contributor for Addis Standard and Ethiosports.